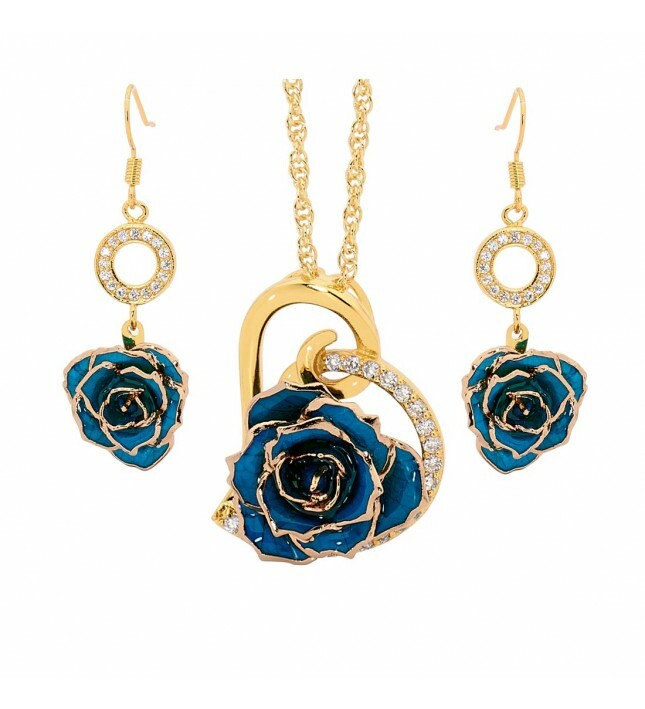 The most beautiful matching gift set which includes a gorgeous blue glazed rose, with a stylish pendant and drop earrings formed from real blue rose petals trimmed with 24K gold. Featuring a romantic heart design, this set incorporates 37 radiant synthetic diamonds studding the earrings and pendant. 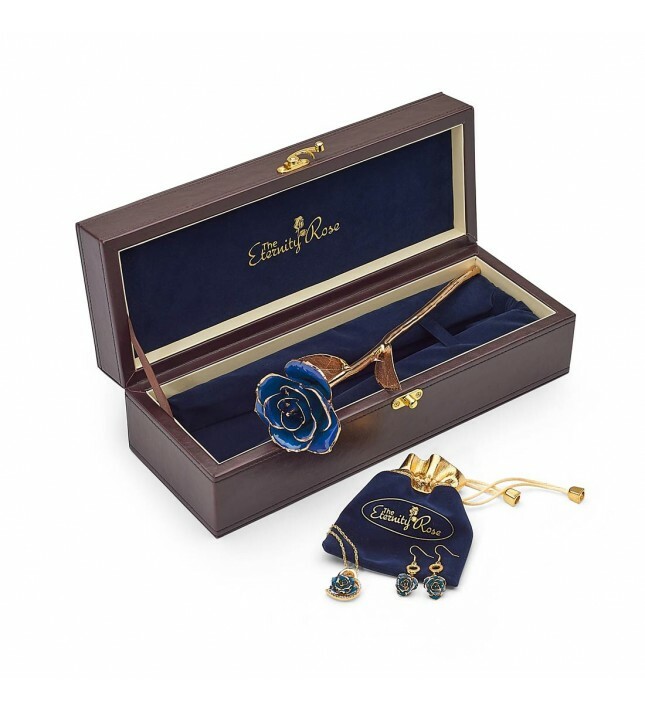 Each set comes with a stylish PU leather case for the glazed rose, and a velvet jewellery pouch is enclosed within. Intricate detailing is supported by lifetime warranties. 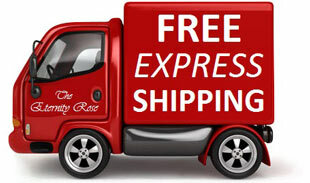 Speedy dispatch and rapid delivery with two-day express transport is included within the price of your order. 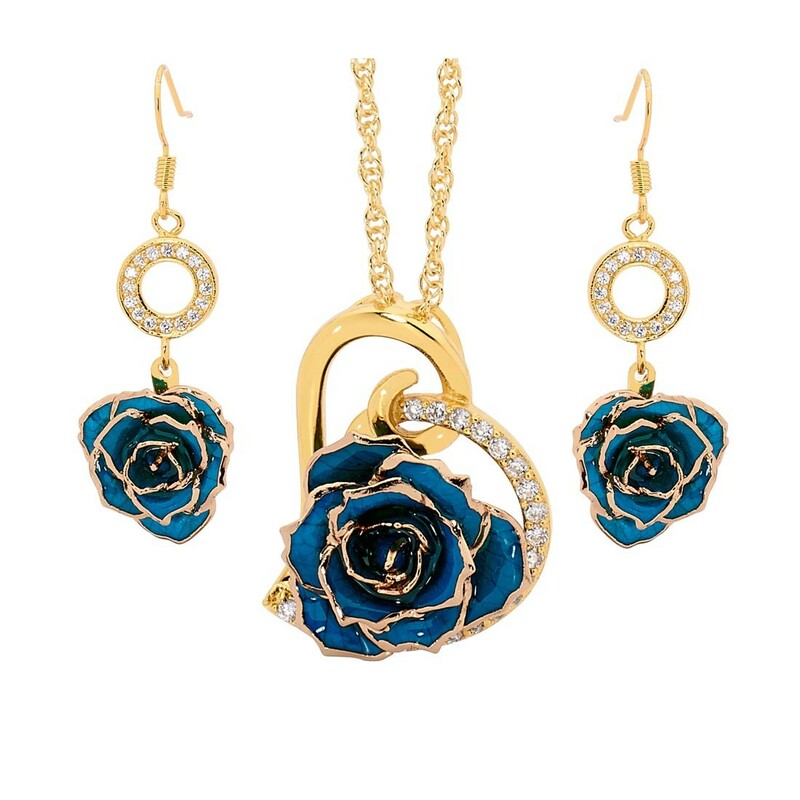 A stunning matching set with a 24 karat gold heart design. 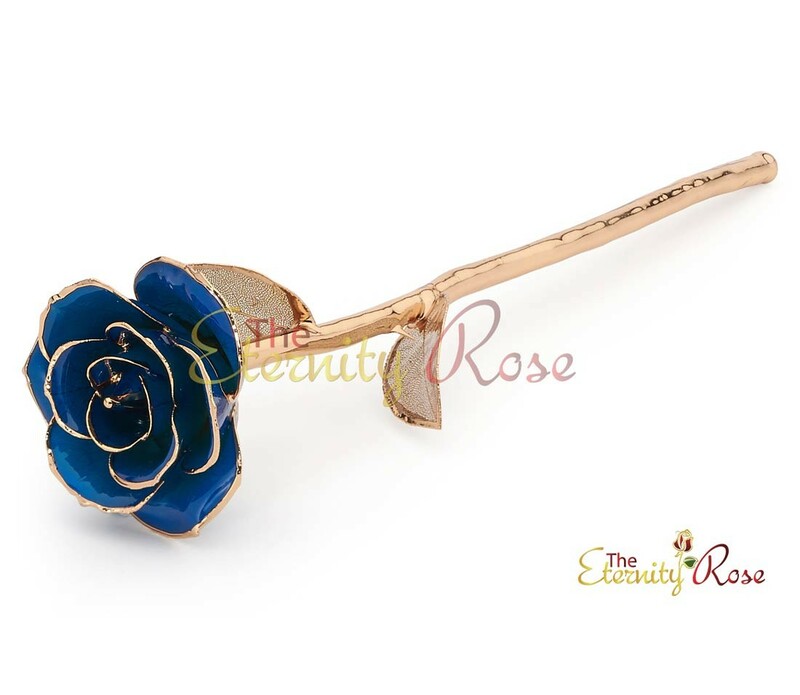 A GENUINE BLUE ROSE, intricately glazed and decorated with 24K gold. 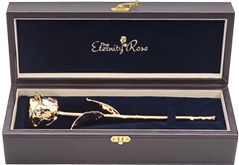 Each rose measures approximately 12” in length and features 24K gold lattice leaves with an elegant glaze. 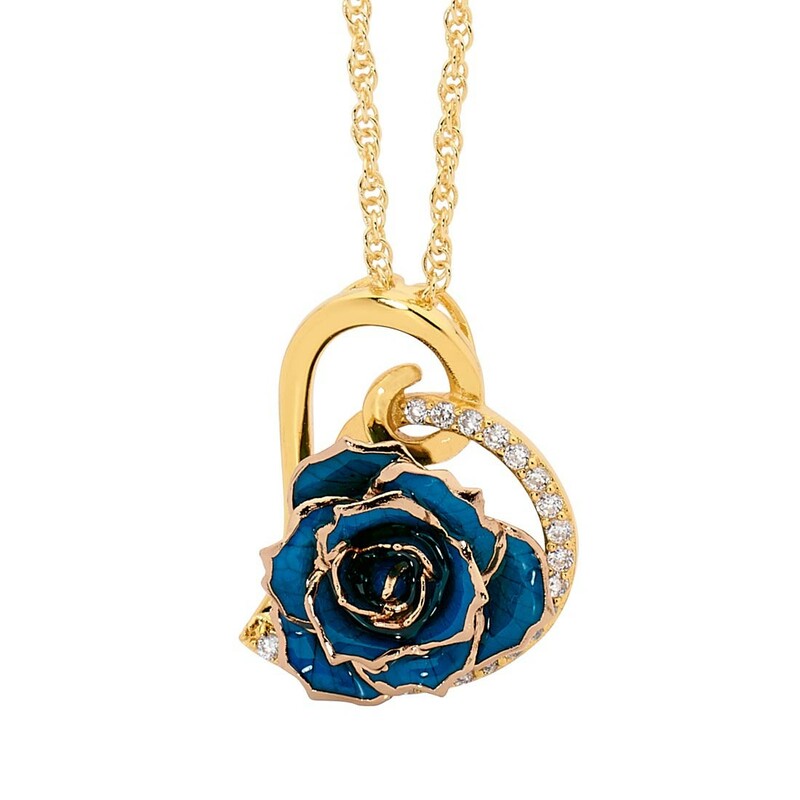 A MATCHING PENDANT formed from real miniature blue rose petals, perfectly glazed and edged with 24K gold. A beautiful stylish multilink chain, dipped in 24K gold is included. 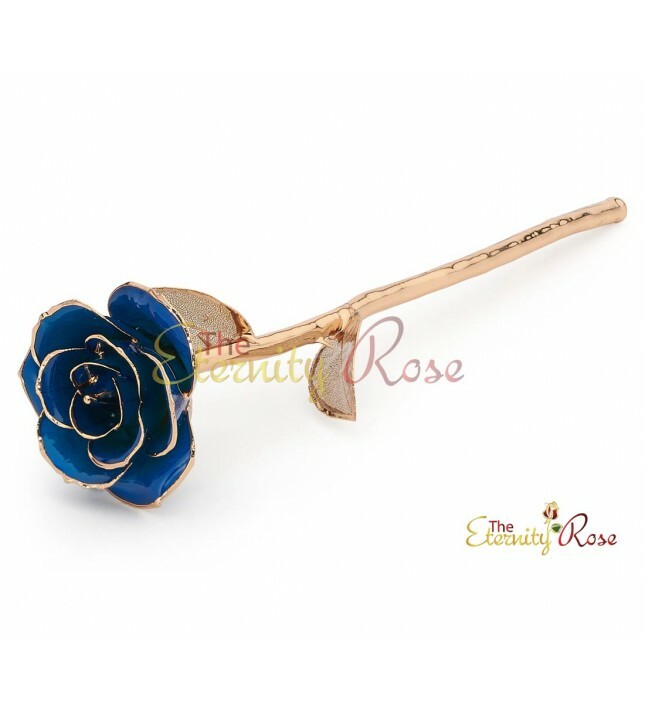 The pendant's rose head diameter measures approximately ¾”. The pendant takes a heart shape which is encrusted with no less than 21 stunning synthetic diamonds. The pendant's overall dimensions are 1.2” x 0.9”. 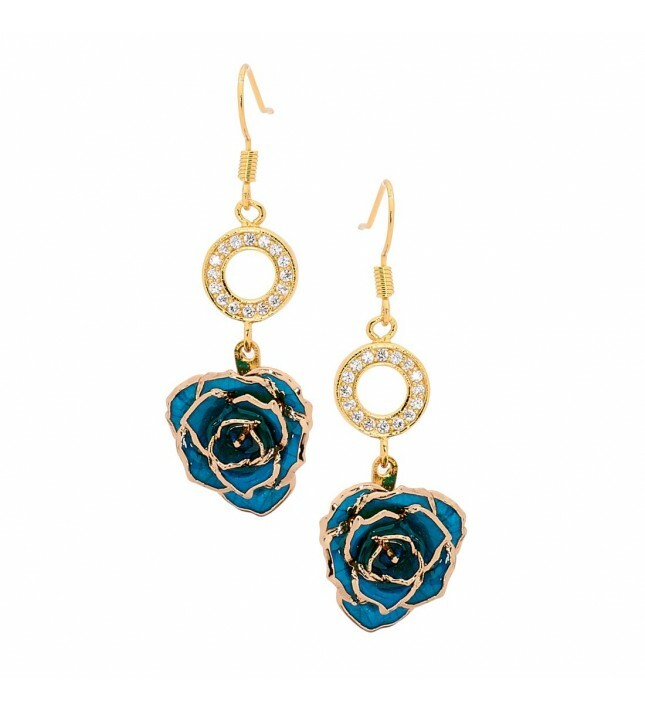 A PAIR OF EARRINGS formed with real miniature blue rose petals, intricately glazed and edged with 24K gold. 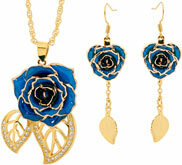 The diameter of the earrings' rose heads measure approx. 5/8” and they are approx. 1.7” long. The earrings feature a gold ringlet studded with 16 beautiful synthetic diamonds. 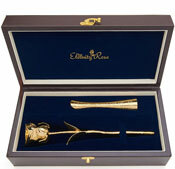 The set comes with an elegant leather presentation case with a sleek velvet lining. 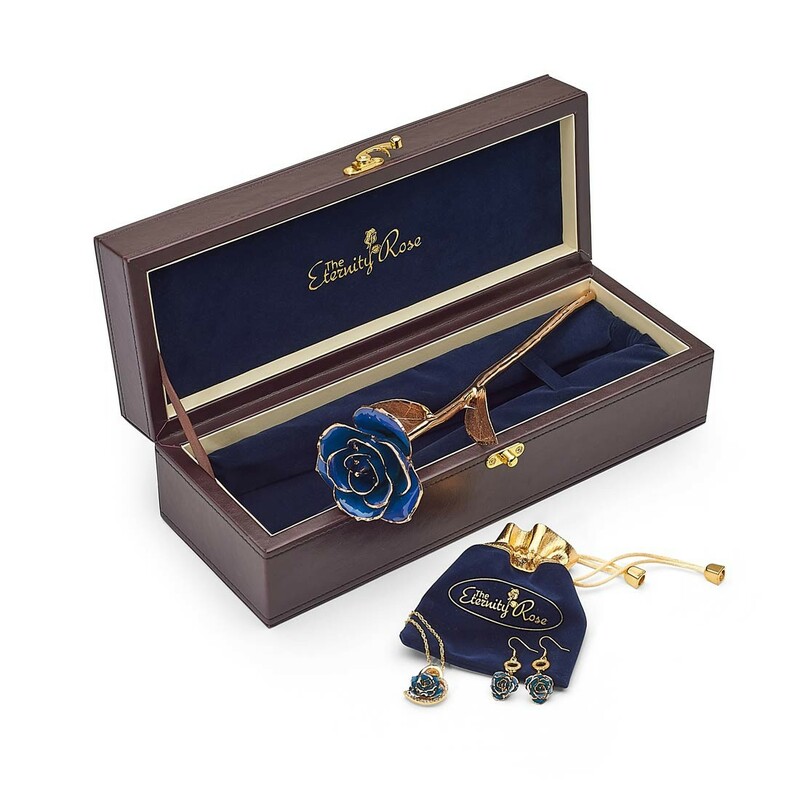 The case measures 13.3” x 4.8” x 4” high and the jewellery is held in a thick navy-blue jewellery pouch contained inside the case. 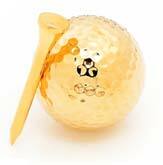 All the items have a generous coating of purest 24K gold. 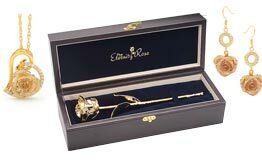 The workmanship of every Eternity Rose item is exquisite, with each piece representing the craftsmen's consummate skill. The glazing and gold-trimming process takes more than three months and 60 individual steps to reach final completion. 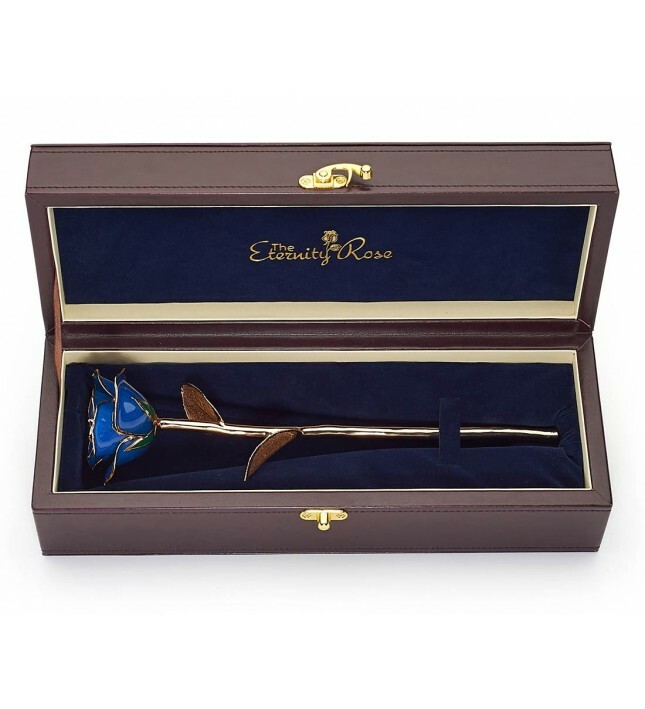 Every item is made by hand resulting in a work of unique art, produced to the highest standards. 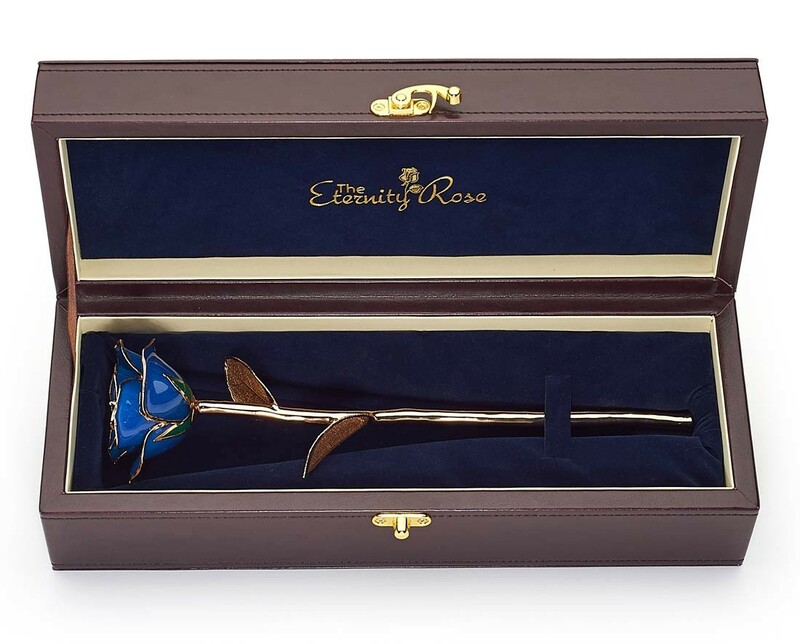 Just like the other items in our range, the quality of this Eternity Rose product is absolute and supported by a lifetime warranty. We subject all of our jewellery to close scrutiny and consider it to be in line with the highest standards in Europe. Our gorgeous products have won a number of awards for their excellent quality and design. Quality is key to us, so we spare no expense in ensuring this beautifully crafted set is perfect. 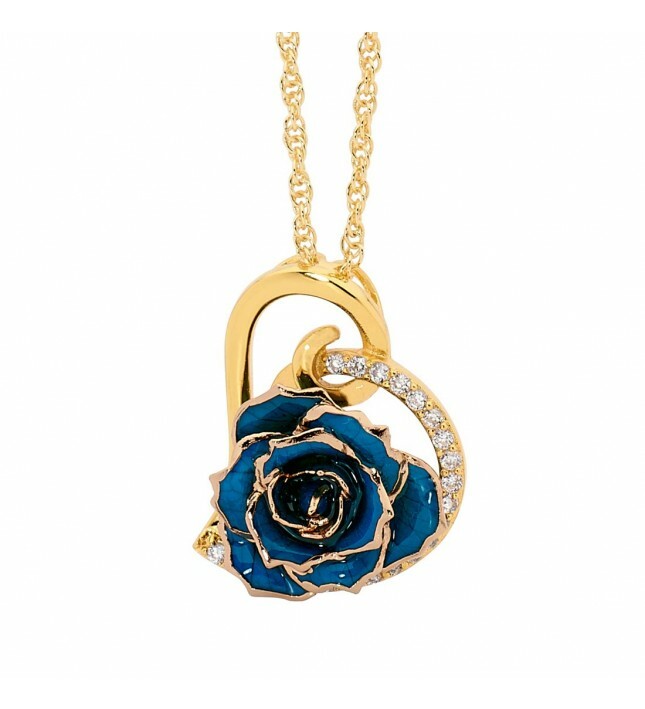 This is the perfect present for any lady who enjoys the glamour of fine jewellery together with the elegance of natural roses.